William Cavendish, The Marquess of Newcastle, was a Royalist Army general during the time of the English Civil Wars. His most famous engagement was at the battle of Marston Moor, just outside York in 1644. Born and bred in South Yorkshire and the East Midlands, Cavendish and his family owned property across South Yorkshire, North Derbyshire and Nottinghamshire. As the Grandson of Bess of Hardwick, he or his wider family owned properties such as New and Old Hardwick Hall, Somercotes, Chatsworth House, Welbeck Abbey and Handsworth Manor. The jewel in his property crown was Bolsover Castle in North Derbyshire. Started by his father Charles and finished by William it was his pleasure palace where he lived out his extravagant lifestyle, entertaining the upper elite and living out his passion for Equestrianism. When war broke out, William was asked to raise an army in the North of England and dressed in their undyed woollen coats and blue bonnets (more commonly associated with Scottish armies of the time) The Marquess of Newcastle’s Regimente of Foote was born. They fought valiantly throughout the first Civll War until a dramatic last stand at the Battle of Marston Moor on 2nd July 1644. To read more about the history of the regiment, please click here. To read about the regiment’s involvement in the Battle of Aldwalton in 1643, check out this great account. To find out all about the regiment’s input at the Battle of Tankersley Moor, you can read this article. Newcastle’s regiment was born in early 1971, mainly by a group new recruits who had joined after the battle of Marston Moor, re-enacted at Castle Howard. 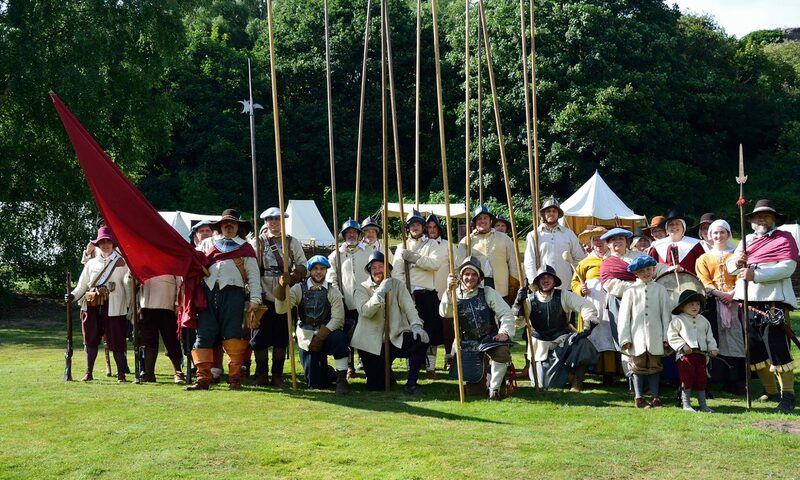 Since then, the regiment has grown to become one of the largest in the Sealed Knot Society. You can still see us on the field of battle today in our iconic Whitecoats and Blue Bonnets. We are based all over the UK with our main regimental stronghold being in South Yorkshire. We also have a hub down in the Bristol/Bath area and other members all over the country from County Durham to Kent and even a foreign outpost in Germany! Our members are of all ages and backgrounds who come together for weekends throughout the year for a mutual love of history (in depth knowledge not necessary!) and enjoying the incredible fun that being a re-enactor brings. We pride ourselves as a regiment on our authenticity, our team spirit and putting on quality and engaging events for both the public and our members. Want to know more about being a Newcastle? Of course you do! Check out Joining The Ranks pages to find out everything you need to know about being part of our regiment. You can then head to our Joining Us page to find out exactly how to come along for a weekend.